Five guards from US security firm Blackwater have pleaded not guilty to the manslaughter of 17 Iraqis in 2007. The charges in a US court relate to an incident in which the five, contracted to defend US diplomatic personnel, opened fire on a crowd in Baghdad. The men are charged with 14 counts of manslaughter, as well as weapons violations and attempted manslaughter. A sixth guard has pleaded guilty to killing at least one Iraqi and has been co-operating with prosecutors. The killings, which took place in Nisoor Square, Baghdad, strained Iraq's relationship with the US and raised questions about the oversight of US contractors operating in war zones. Donald Ball, Dustin Heard, Evan Liberty, Nick Slatten and Paul Slough - all of whom are decorated military veterans - pleaded not guilty before a US federal court in Washington. They say they were acting in self-defence, but witnesses and family members of those killed maintain that the shooting on 16 September 2007 was unprovoked. Young children were among the victims. The Iraqi government has described the guards as "criminals". As well as the 14 counts of manslaughter, they face 20 counts of attempted manslaughter and one count of using a machine gun to commit a crime of violence, a charge that carries a 30-year minimum sentence. 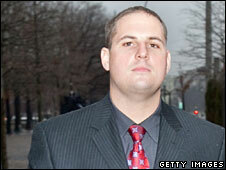 A sixth Blackwater employee, Jeremy Ridgeway, agreed to a plea deal in return for testifying against his colleagues.